Skull Fractures During Birth in Washington D.C. Your champion in courtrooms throughout Washington, D.C. The bones in your infant child’s skull are not fully fused at birth, so everyone – new parents, attending physicians, friends and family – must handle the baby’s head with great care. If the skull is crushed in any way, your child could face permanent disfigurement or brain damage. 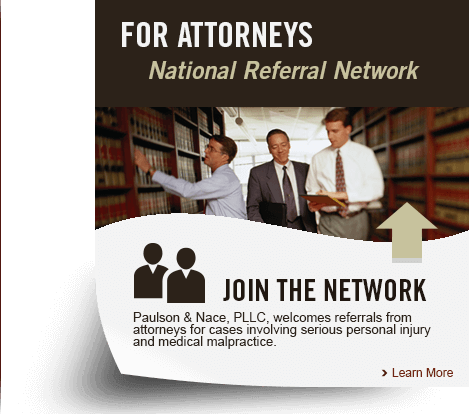 At Paulson & Nace, PLLC, we know exactly what a family faces when their newborn is injured; we know what kind of lifelong care may be necessary, and what your expenses could be. That is why we advocate so aggressively on behalf of families throughout Washington, D.C. whose children have suffered a skull fracture at the hands of a negligent medical team or because of a defective medical device. We have the skills, the resources, the experience and the drive to help you protect your family and your future. A skull fracture is usually diagnosed if the newborn show signs of swelling or bruising, or if the head seems misshapen or disfigured. Some babies have fluids, including blood, leaking out of their ears, eyes and noses. If left untreated, however, the baby could suffer with seizures or strokes, and the area around the brain could swell. If there is too much pressure around the brain, your child could end up with permanent brain damage. As one of the premier medical malpractice law firms in Washington, D.C., we have experience in birth injury cases like these. We are able, through the use of authoritative testimony and cutting-edge technology, to accurately and thoroughly provide visual representations and learned explanations to judges and juries about what your child suffered, and why that suffering was the result of medical negligence. Over the past four decades, we have secured millions of dollars for our clients – compensation they needed not only to cover their medical bills, but to provide the types of treatments necessary to help their children who required lifelong medical care. Family is the most important thing in this world. When your family is hurting, our family seeks justice on your behalf. Together, we find the answers you need, and help you plan for your new future. We know that you are anxious and afraid for your child. At Paulson & Nace, PLLC, we have helped alleviate some of those fears and stresses for families throughout Washington, D.C., and we want to do the same for you. To schedule a no-obligation consultation with one of our birth injury lawyers, please call 202-930-0292 or fill out our contact form.